As you probably know, I live in Miami, but as I spend more than 250 nights in hotels around the world I love it when I can stay at home. 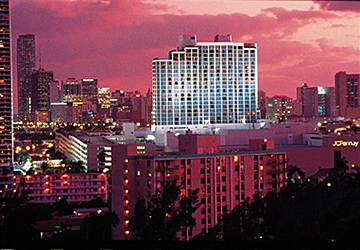 This year, I am happy that the Questionmark Users Conference is in Miami March 14 – 17! So much so that I’ve posted some pictures and videos to my blog that I feel capture the spirit of Miami, South Beach and what you can expect when you attend the conference. This year’s conference will have a strong focus on Questionmark Perception version 5 and new trends in assessment delivery. In addition to tech training, case studies, best practice sessions and peer discussions, you’ll be able to meet one-on-one with our technicians and product managers and network with other Perception users who share your interests. We are proud to be making this conference greener than ever. The Hilton Miami Downtown participates enthusiastically in the Florida Green Lodging Program, and we at Questionmark are doing our part for the environment by reducing the amount of paper we use, decreasing the size of our conference notebooks and making handouts available online. I love living in Miami and think it’s a vibrant, colorful and friendly backdrop for the conference. I hope you will take the opportunity to stroll down Lincoln Road in South Beach during our Monday evening dine-around and that you’ll join us on Tuesday evening for a dinner cruise around the harbor. These events are a lot of fun, but they also have a serious purpose: helping you get to know colleagues who share your interest in assessment and create connections that will help you succeed in your work. I can’t wait to welcome you to the conference—and I am looking forward to learning together with you. So come on down to Miami and warm up! Early-bird registration for the conference ends today, so I hope you can sign up soon.